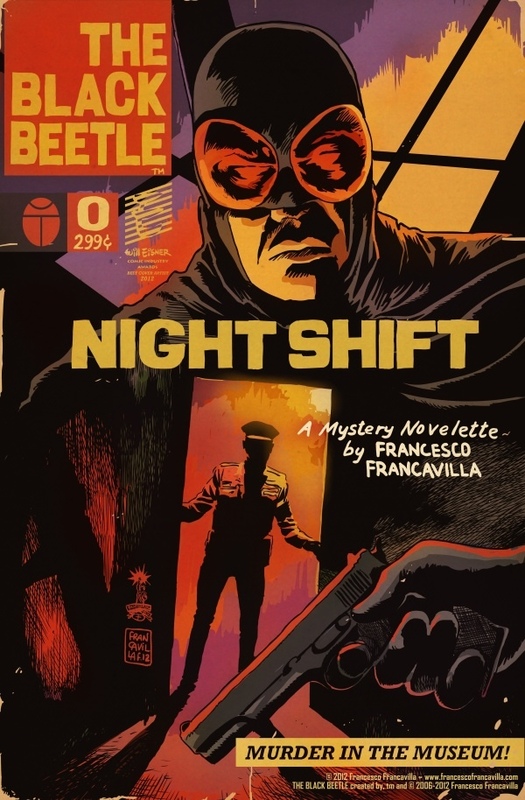 Dark Horse Comics is thrilled to announce a new creator-owned series from Francesco Francavilla, the 2012 Eisner Award winner for Best Cover Artist! 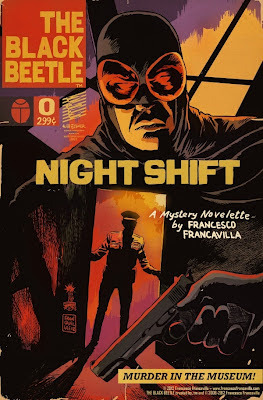 Francavilla’s critically acclaimed The Black Beetle returns in December with The Black Beetle #0, which will collect the three-part story entitled Night Shift that originally appeared in the pages of the Eisner Award–winning Dark Horse Presents. The issue will feature a brand-new cover, twenty-four story pages, and bonus sketch material and art! January brings The Black Beetle: No Way Out, a four-issue story that marks the first full series for Francavilla’s Black Beetle, continuing from the self-published, limited-edition ashcan comic of the same name—the first appearance of this exciting new pulp hero! In Night Shift, an ancient artifact known as the Hollow Lizard—a powerful totem of dark magic—shows up at the Colt City Natural History Museum. Hitler sends his fearsome Werwolf Korps to collect the piece in hopes it will help him unlock the secrets of ancient Egypt’s Black Priests. Unfortunately for the führer, Colt City’s protector, the Black Beetle, is on the case! In No Way Out, Black Beetle’s investigation of two local mob bosses is interrupted when a mysterious explosion murders them and a pub full of gangsters—taking out most of Colt City’s organized crime in one fell swoop. Who could pull off such a coup, and what damage might that murderous bomber inflict upon Colt City and Black Beetle? Francavilla’s The Black Beetle series will also showcase a letter page so fans have the chance to have their thoughts, comments, and compliments answered by the creator himself! E-mail blackbeetle[at]darkhorse[dot]com for a chance to see your letter in The Black Beetle: No Way Out! Look for The Black Beetle #0 on comic store shelves everywhere on December 19, 2012!